Does methane rule review shut out public input? More than 600 people attended a Feb. 16, 2016, forum on BLM's Methane and Waste Prevention Rule in New Mexico, according to the Farmington Daily Times Photo by Don Schreiber. Don Nelson estimates he can spot 60 or 70 natural gas flares from his North Dakota ranch — even now that the state has raised its gas capture rate to nearly 90 percent. Ahead of the release of the Bureau of Land Management's final Methane and Waste Prevention Rule, Nelson attended two hearings to testify in support of the regulation to curb gas flaring, venting and leaking from oil extraction operations on federally controlled lands. "I think it's the biggest waste I've ever seen in my life," he said. Nelson joins a chorus of Westerners and environmentalists calling on President Trump's Interior Department not to shut out public input on its reconsideration of the BLM rule (Greenwire, April 12). Following the release of Trump's "energy independence" executive order, Interior Secretary Ryan Zinke called for a 21-day review to determine whether the rule — and at least two other department regulations — was fully consistent with the new administration's policies. Zinke handed down his order March 29. The review process isn't unlike efforts by previous administrations to look back at rules introduced by their predecessors, according to an Interior spokeswoman. The executive and secretarial orders simply offer a more formal process, the agency says. Putting a 21-day deadline on the process is not typical, said Alexandra Teitz, who previously served as counselor to former BLM Director Neil Kornze. "Although new administrations commonly review previous administration policies, this deadline-driven rule review process is not usual," she said. Interior's review of an Office of Natural Resources Revenue regulation is an example of the course it could ultimately take on the BLM methane rule. Earlier this month, Interior proposed to repeal recent amendments to ONRR's oil, gas and coal valuation rule. An advance notice of proposed rulemaking and request for public comment appeared in the Federal Register (Energywire, April 4). "If Interior wants to do this in a legally defensible way, it will of course have to go through public notice and comment, and it has to address any substantive comments made from any party, whether it's industry or an environmental group," said Western Energy Alliance President Kathleen Sgamma. The alliance has been a vocal critic of the BLM methane rule. It has supported repeal of the regulation under the Congressional Review Act, which would — with the support of a simple majority in Congress — remove the rule and preclude BLM from reissuing a rule in "substantially the same form" as the disapproved regulation. "It's troubling that all this work that an agency that we put in charge to manage these areas could be undermined by a simple vote," said Garett Reppenhagen, Rocky Mountain director of the veterans' advocacy group Vet Voice Foundation. He attended two public forums on the methane rule. Efforts to repeal the BLM methane rule under the CRA have stalled in the Senate. The deadline for voting on CRA resolutions is May 10 — 12 business days after Congress returns from April recess, according to the watchdog group Public Citizen. Agencies, on the other hand, are beholden to the Administrative Procedure Act, which requires opportunity for public comment. "If Interior doesn't follow the process, they leave themselves open to litigation," Sgamma said. "It just doesn't make sense not to go through the regular Administrative Procedures Act process." Scant details around the 21-day review process and moves by the Trump administration to rescind Obama-era rules using blunt instruments like the CRA have raised concerns for some proponents of the BLM methane rule. Kristin Winn, a member of Citizens for Clean Air in Grand Junction, Colo., said she backed the regulation because it ends states' patchwork approach to controlling greenhouse gas emissions. While Colorado has strong regulations on methane releases from oil and gas operations, neighboring states like Utah do not, she said. 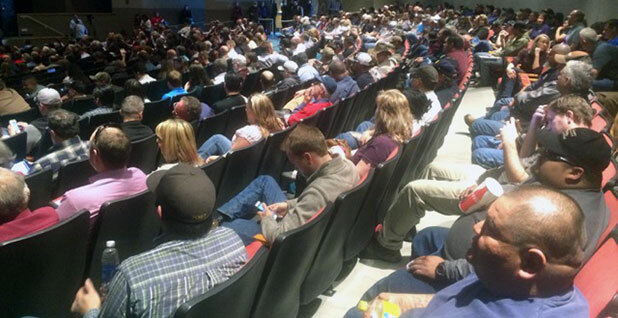 March - May 2014 BLM conducts public listening sessions to develop a proposed rule. October - December 2015 OIRA takes meetings with stakeholders to discuss proposed rule. Feb. 8, 2016 Proposed rule published in the Federal Register, opening a 60-day public comment period. June - August 2014 BLM hosts public meetings to discuss the proposed rule. April 22, 2016 Extended comment on proposed rule closes. September - November 2016 OIRA takes meetings with stakeholders to discuss final rule. Nov. 18, 2016 Final rule published in the Federal Register. "When the wind blows from the west, all of that stuff blows into our valley," Winn said. "Air quality knows no boundaries." Last year, Winn traveled to Denver to speak in support of the BLM rule. What would normally be a four-hour trip turned into a seven-hour drive after a rock fall in Glen Canyon forced her group to take a detour. Turning back wasn't an option, Winn said. "When BLM talks about holding these public meetings, it's incredibly important to people to be able to go," she said. "It's a little troubling to me when, after three years of soliciting public input, the Interior Department thinks it's going to take them three weeks to review this rule." Don Schreiber drove an hour and a half each way to a Feb. 16, 2016, public listening session in Farmington, N.M. He says flaring on public lands near his New Mexico ranch threatens not only his property, but also his health. He believes that — even if Interior considers comments from him and other proponents of the rule in its 21-day review — the process is inherently biased toward industry perspectives. "It reduces the passion and the personal experience that can be conveyed to a panel of decision-makers during a public forum," Schreiber said. Those passions were on display at last year's hearing, he said. The format allowed for an open and respectful exchange of ideas, he added. Schreiber counts many of the BLM rule's opponents as his friends. "We have strong and sometimes heated discussions about the rule, but that doesn't mean we're not friends," he said. "I have a unique sympathy for those who are defending the rule. I don't want to lose the family history we have by disrespecting those people. I have a lot of sympathy for why they hold their point of view." Over the weekend, Schreiber attended a farm bill listening session in Durango, Colo. He said he looks forward to the day the dust settles on the Trump administration's multipronged effort to dismantle the BLM methane rule. Only then will he be able to fully turn his attention to his true passion — his ranch.